We're looking at the technological advancements that allow us to feed our ever-growing population. 10,000 years ago, our ancestors lived a completely different lifestyle. They were nomadic people living in small groups, constantly moving in migratory patterns and hunting and gathering their food. Today, the majority of the seven billion people living on the planet have permanent residences in, or near, major cities. Most of us have easy access to clothing, food, and home goods. While there have been thousands of developments over the past 10,000 years that have bridged the seemingly impenetrable gap between ancient hunters-gatherers and modern consumers, none has been more impactful than the advent of agriculture. Today, we define agriculture as the practice of cultivating soil, producing crops, raising livestock, and (to some extent) the preparation and marketing of the resulting products. Agriculture represents 20% of the national economy, and is the one of the most compelling reasons that our global population has boomed. While agriculture has a long history, the greatest leaps in technology were made in the 18th-21st centuries. We decided to look at five main categories of technological development that have made the greatest impact on the global population: animals, crops, soil, labor, and storage. Before we get into the technology that changed agriculture, let’s quickly review just some of the major scientific discoveries that made much of this progress possible. Research performed originally by scientist Carl Sprengel and popularized by Justus von Liebig identified that nitrogen (N), phosphosus (P), and potassium (K) are essential for plant nutrition. They also published findings that plants take carbon, hydrogen, and water out of the atmosphere. Additionally, Liebig popularize the Law of the Minimum, which stated that a plant’s growth is not determined by the total amount of resources available, but by the resource that is least available. Darwin proposed a theory of evolution by natural selection, where changes that allow an organism better adapt to its environment will help it survive and have more offspring, thus creating a lineage with altered and improved characteristics. This theory was made through observations only; Charles Darwin had no knowledge of genetics and the impact of genetic mutations. Mendelian inheritance is the longest standing theory of genetics that is still applicable today. It was developed by Gregor Mendel after he performed experiments with pea plants, which deduced that genes come in pairs and are inherited as distinct units, one from each parent. This became the basis of our understanding of human, plant, and animal genetics! Here's a great overview of Mendel's theory! Now that we know the basics, let’s look at the technology that paved the path to today’s agro-industrial complex. It’s important to understand that all of these advances needed each other to develop, as breakthrough technology in one category created opportunity for the others to expand. Most agricultural progress seen in the meat and dairy industries had to do with increasing production. As a result, meat and dairy products became more affordable, and became more prevalent in Western diets. Robert Bakewell, one of the first agriculturists to breed cows and sheep for meat, was a pioneer of selective breeding methods. Selective breeding involved mating animals to reproduce favorable qualities in the offspring (such as bigger, more muscle, better wool production, etc). Although Bakewell lived before Darwin and Mendel, his practice of selective breeding aligned with both theories of genetic inheritance. Selective breeding later became a cornerstone for the factory meat industry as ways to create animals with higher meat, eggs, or milk outputs. 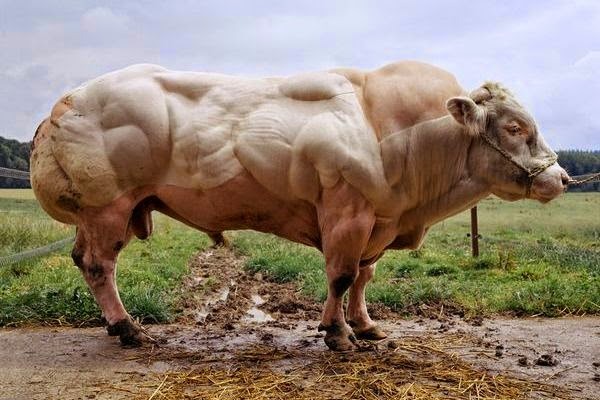 The Belgian Blue cow's genetic make-up makes it more efficient at gaining muscle mass. This gene mutation was maintained through line breeding to make it a fixed property of the breed! Louis Pasteur’s research showed that microorganisms were the reason for food spoilage. He found that heating liquids like milk to between 60 and 100ºC killed most of the bacteria. This process became known as “pasteurization”, and it’s discovery made it possible to preserve and transport dairy goods much longer and further than ever before. Alexander Fleming discovered penicillin, the world’s first antibiotic. It was successfully used to treat infection in 1930, and was mass-produced in the late 1940s. As factory animal farming became more prevalent, animals began receiving antibiotics to prevent viruses such as rotavirus, E. coli, pinkeye, and brucellosis. This allowed for animals to adapt to close and often unsanitary living conditions of feedlots that made meat abundant and affordable. Patented by Monsanto, rBST is a synthetic cow hormone. When administered to dairy cows, the hormone increases milk production 14 percent, while consuming less grain and water. This allowed the dairy industry to expand and increase their output. Similarly to the meat and dairy industries, advancements in crop production were mainly concerned with increasing crop yields. Thanks to the creation of more resilient breeds of corn and soy, along with long-standing government support for these commodity crops, most farmland moved towards single crop production (also known as monocultures). Furthermore, crop resilience helped create food reserves and drastically reduced famine around the world. George Harrison Shull showed that a hybrid corn plant created from two inbred species would increase the plant’s yields significantly. In 1924, hybrid seeds were sold commercially and by the 1950s the majority of U.S. corn was hybrid. This development allowed corn to become a dependable commodity crop that would later be used as nutritionally dense animal feed (making animals fatter faster) and for producing penicillin (1940), high fructose corn syrup (1970s), ethanol (1970s), and more. See how corn, watermelons, and peaches have changed thanks to selective hybrid breeding over the past 9,000 years. A practice started in 1930 and still used today, mutation breeding uses radiation to create random mutations in seeds. Thanks to this practice, scientists have produced thousands of improved plant varieties (rice, wheat, barley, peas, cotton, peanuts, grapefruit, bananas, and cassava to name a few). This is not genetic modification, but a way of nudging species towards useful mutations that make them more productive and resilient. Although principles of hydroponics have been around for centuries, they were popularized by Dr. W.F. Gericke, who displayed enormous tomatoes that were grown without soil. By the 1960s, many hydroponic greenhouses and farms were operating around the U.S. as a first example of alternative farming methods. Paul Muller discovered DDT, a broad spectrum synthetic pesticide that had a widespread effect on insects, but a seeming low toxic effect on mammals. It was not water soluble and was easy and inexpensive to apply. While it was later proven that DDT was toxic to aquatic animals and had many indirect negative effects on the environment, this was the first widely adopted and inexpensive pesticide which greatly increased food supply and decreased plant disease. In the 1940s, scientist Norman Borlaug began performing experiments in Mexico to develop disease resistant, high-yield wheat crop varieties in an effort to make Mexico more self-sustainable. He succeeded, and Mexico became a global exporter of wheat. Borlaug and the Ford Foundation replicated this success in India in the 1960s with high performance rice (IR8), which allowed India to become a global rice exporter. The IR8 rice strain was later adopted all over Asia. 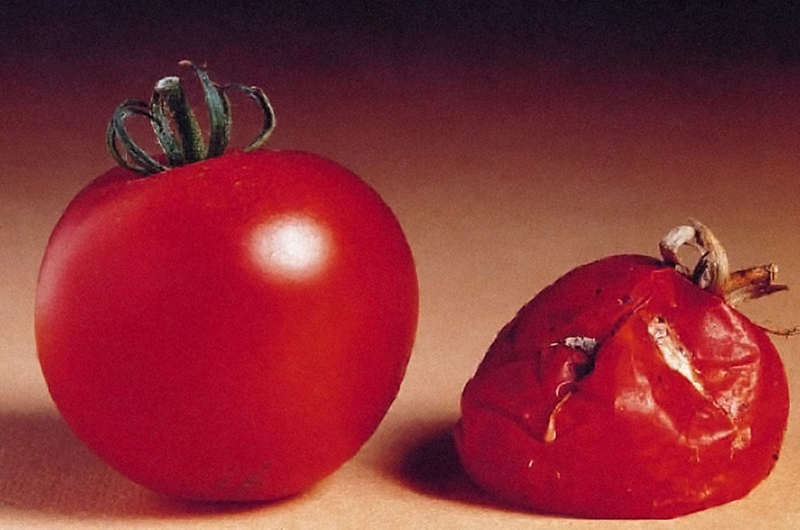 The Flavr Savr tomato was the first commercially produced genetically modified food to be deemed safe for human consumption. It was created by Calgene, a company later acquired by Monsanto. Since 1994, Monsanto has produced several genetically modified products like squash and soy in 1995, corn in 1996, sugar beets in 2006, potatoes in 2016, and, most recently, apples in 2017. Most genetic modifications are designed to make food insect and disease resistant, tolerant to herbicides, and more visually appealing. Although soil-less methods like hydroponics and aquaponics have become increasingly popular over the past century, most global agriculture is still soil dependent. Historically, advancements in soil technology has been centered around replenishing and extracting as many nutrients as possible to improve plant yields. Patented by Sir John Bennet Lawes, superphosphate was a manure formed by treating phosphate with sulfuric acid, which gave rise to the synthetic fertilizer industry. Once it was adopted, the commercial fertilizer took the agricultural industry by storm: In less than 100 years, annual commercial fertilizer use has gone from 1.8 million tons in the 1890s, to 47.4 million tons in the 1980s. As Liebig determined in his research, nitrogen is essential for plant health. Fritz Haber created a process for pulling N2 out of the atmosphere and turning it into ammonia (i.e. nitrogen fixation) to be used as fertilizer for industrial feedstocks. The process was perfected and scaled to meet industrial needs by Carl Bosch. For centuries, agricultural development was limited by time: men and horses could only do so much in one season. The development of farming machinery unlocked huge potential, which technological animal, crop, soil advancements were able to fill. Invented by Eli Whitney, the cotton gin was one of the greatest contributors to the American Industrial Revolution. It greatly simplified the process of removing seeds from picked cotton–previously an extremely slow and tedious process. While the cotton gin inadvertently led to the rise of slavery in the South, it is still considered one of the most influential agricultural inventions of the 20th century. Developed by Joseph Dart and Robert Dunbar at the rise of the grain trade. The grain elevator was originally a steam-powered deposit for grain awaiting to be sold. Steam-powered conveyor belts brought the grain to a storage platform at the top of the elevator, where it was kept until offloading. Then, the grain would be brought down using gravity, and loaded onto trains or ships for distribution. Not only did the creation of elevators significantly reduce labor, but they also kept the grain “dry, cool, free from vermin, and safe from pilferage”. 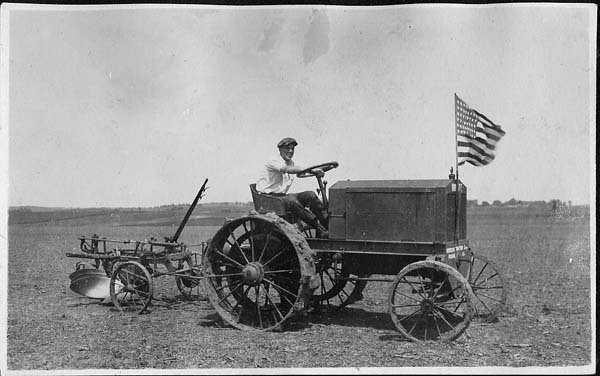 Invented by John Froelich, the tractor was able to harvest 1,000 bushels of grain using only 26 gallons of gasoline, which far exceeded the harvesting capacity of farmers–it took 40-50 labor hours to harvest just 100 bushels using wagons and horses. By 1954, tractors exceeded the use of horses, and by 1955 the labor needed to harvest 100 bushels was reduced to just 6.5 hours. While decreased labor hours were able to bring an abundance of food to the market, it was pointless without refrigeration. Food cooling and freezing technology expanded food’s lifespan, made it easier to transport long distances, and allowed people to buy for the future. The first refrigerator, built by James Harrison and patented in 1856, was a vapor compression system using ether, alcohol, or ammonia. 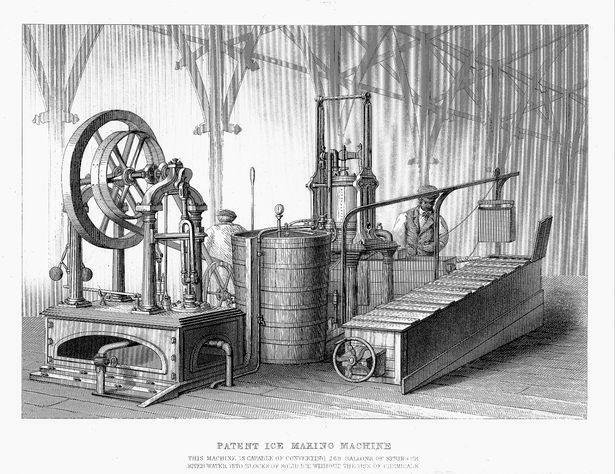 He introduced the technology to breweries and meat packing houses, and had several systems in operation by 1861. 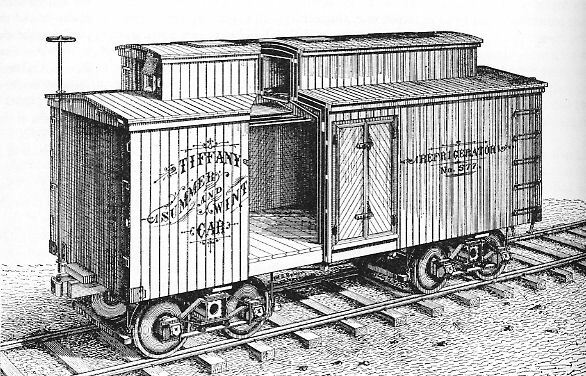 The first refrigerated railway car was patented by J.B. Sutherland. It used heavy insulation, roof hatches, floor drains, ice bunkers, and strategic airflow. As a result of this cold transport system, a huge network of icing stations were developed around the country, and the first transcontinental transport of cold goods from California to New York occurred in 1889. The birth of the frozen food industry is tied to Clarence Birdseye’s patent for a multi-plate freezing machine, which allowed for food to be quickly frozen without damage. By 1927, his frozen products included fish, meat, poultry, fruit, and vegetables. 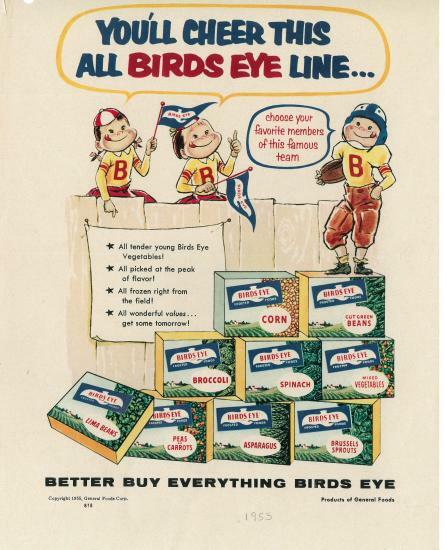 Birdseye later sold his patent to what eventually became the General Food Corporation to produce the Birdseye Frozen Food Company. By World War II, Americans were encouraged to buy frozen foods, with 800 million pounds purchased between 1945 and 1946. However, it was the invention of the TV dinner that made frozen food an American stable in 1954. Companies like Electrolux and General Electric began selling refrigerators and freezers for domestic purposes at a commercial scale. Unlike previous models, these units used Freon instead of toxic gases, making it a safer option. This coincided perfectly with the development of frozen foods (as we learned above!). By 1950, more than 90 percent of urban homes had a fridge. So, where do all of these technological advancements leave us today? For one, they have made it possible to feed over 7 billion people: From 1820 to 1975, agricultural production across the world doubled four times over and, while in 1940 one farmer could supply an estimated 10.7 people, by 1990, one farmer could supply 100 people. Today, one farmer can feed 155 people. As a result, we have seen a global decline famines and hunger, with a rate of undernourishment at 10.8 percent in 2015 (although this number has risen in recent years as a correlation to rising conflict and instability in many regions). Soil nutrient degradation due to planting one type of crop over and over again, leading to a dependence on synthetic fertilizer. Extreme water usage and waste. The chemical contamination of groundwater (as a result of fertilizer usage). The introduction of dangerous pesticides and herbicides into the ecosystem and their widespread repercussions on insect and animal populations. Introduction of new bacteria and pathogens into the food supply–a result of factory farmed animals living in unsanitary conditions. The development of antibiotic resistant bacteria as a result of antibiotic overuse in factory farmed animals. Environmental pollution caused by machinery and animal excretions. Rising rates of “western” diseases such as obesity, heart disease, cancer, and diabetes as a result of over consumption of readily available corn, soy, and meat products. As a result, many of today’s newest technologies are focused on creating alternative methods of agriculture that will be more environmentally sustainable, as well as viable options in the face of climate change and increasingly irregular weather patterns. Just as urban farming boomed starting in 2009, so did the agricultural data industry. Farm management software such as Spensa Technologies (2009), Mavrx (2012), farmhand (2013) Granular (2014), Trace Genomics (2015), and many others arrived on the market to give farmers more transparency into their farmland using satellite imaging, sensors and IoT technology, robotics, and more! The goal is to increase efficiency, and help farmers implement eco-friendly solutions easily on a large scale. Company mOasis has created a hydrophilic gel (“hydro” = water, “phillic” = loving) that can be added to soil to absorb 250 times its weight in water. As a result, farms can use less water and improve their yields by 18 percent across the board. The gel is non-toxic and can break-down safely after several seasons. California approved mOasis’ first product for commercial use in November 2013. This is perhaps the most extreme solution to many of the problems we see with factory farmed meat today, which requires huge amounts of water, pollutes the environment, and produces 14.5% of global human greenhouse-gas emissions. Lab-grown meat would help address the growing global demand for affordable meat while leaving a less damaging footprint. The world’s first lab-grown burger was introduced in August 2013. The first robotic insect took flight in May, 2013 at Harvard University. It was based on the anatomy of a small fly, and inspired more projects in Japan which went on to create a robotic bee. The need to develop this technology is urgent: the U.S. alone has lost 44% of it’s honeybee population in 2016, leading experts to consider what a world without our most essential pollinators might be like. Even industry giants like Walmart are getting involved in developing this technology. Want to learn more about how Freight Farms is changing the future of agriculture?